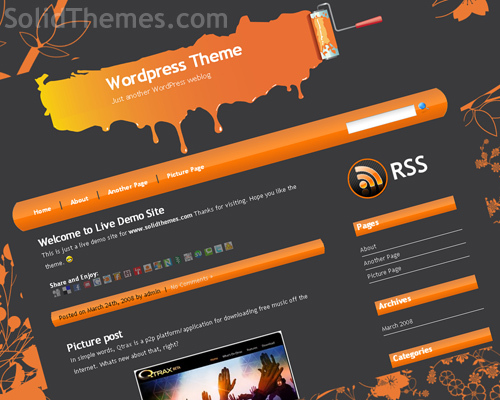 Paint Job is a free WordPress theme which was recently released. 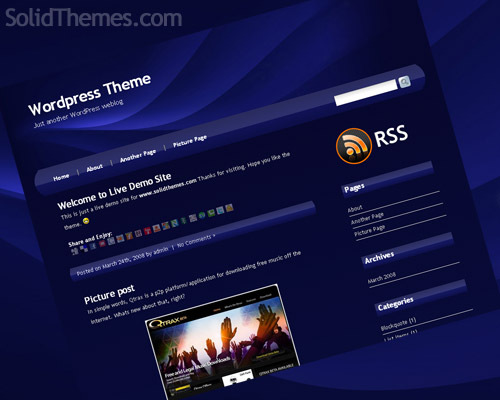 It is fully compatible with wordpress 2.7.1 and has tagging and tag cloud enabled. 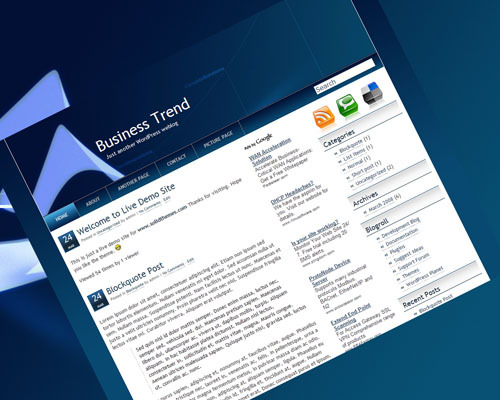 Posted in 2 column, Bright, Fixed Width, Orange, Right Sidebar, web 2.0, Widget ready, Wordpress Themes | 2 Comments » | Read more..
1st Class Blue is a free WordPress theme which was recently released. It is fully compatible with wordpress 2.5.1 and has tagging and tag cloud enabled. Posted in 2 column, Dark, Fixed Width, Navy blue, Right Sidebar, web 2.0, Wordpress Themes | 3 Comments » | Read more..
SEA EDGE is a free WordPress theme which was recently released. It is fully compatible with wordpress 2.5 and has tagging and tag cloud enabled. 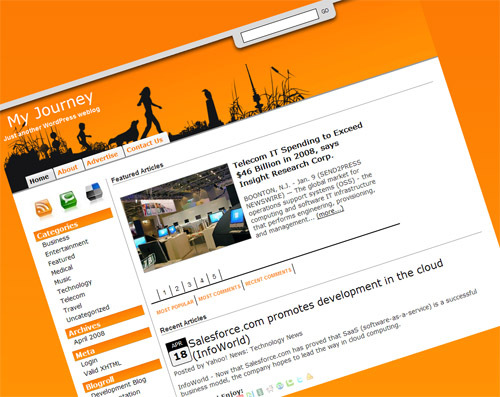 Posted in 3 column, Dark, Fixed Width, Left Sidebar, Right Sidebar, Widget ready, Wordpress Themes | 3 Comments » | Read more..
My Journey is a free WordPress theme which was recently released. It is fully compatible with wordpress 2.5 and has tagging and tag cloud enabled. Posted in 2 column, Bright, Fixed Width, Left Sidebar, Orange, Widget ready, Wordpress Themes | Comments Off on My Journey WordPress Theme | Read more..
Business Trend is a free WordPress theme which was recently released. 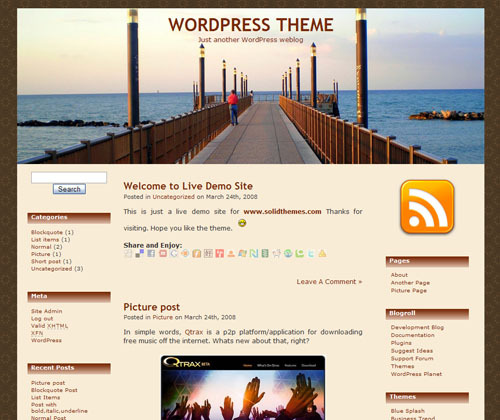 It is fully compatible with wordpress 2.5 and has tagging and tag cloud enabled. 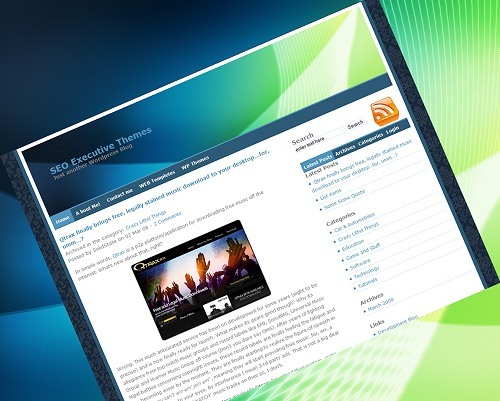 Posted in 2 column, Adsense Ready, Business, Fixed Width, Navy blue, Right Sidebar, Widget ready | 5 Comments » | Read more..
SEO Executive is a free WordPress theme which was recently released. It is fully compatible with wordpress 2.3.3 and has tagging and tag cloud enabled. Posted in 2 column, Adsense Ready, Bright, Fixed Width, Right Sidebar, Widget ready | 3 Comments » | Read more.. 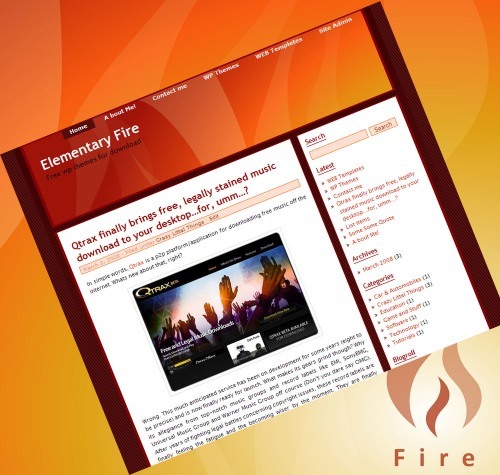 Elementary Fire is a free WordPress theme which was recently released. It is fully compatible with wordpress 2.3.3 and has tagging and tag cloud enabled. Posted in 2 column, Adsense Ready, Bright, Fixed Width, Orange, Red, Right Sidebar, Widget ready | 2 Comments » | Read more.. 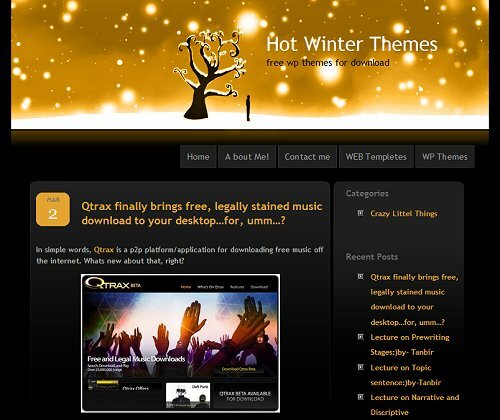 Hot Winter is a free WordPress theme which was recently released. It is fully compatible with wordpress 2.3.3 and has tagging and tag cloud enabled. Posted in 2 column, Adsense Ready, Black, Fixed Width, Orange, Right Sidebar, Rounded Corners, Widget ready | 2 Comments » | Read more..
Wordpress Themes | Designed and Maintained by TA | Copyright 2008-2013 SolidThemes.com. All rights reserved.